Studios, leaders in the manufacturing of boxed holiday cards. Hope your holidays are filled with much joy and happiness (Inside Verse) Gold Foil, Embossed accents. 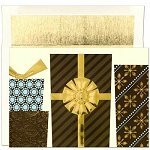 Holiday Collection by Masterpiece Studios Verse Color: Chocolate Brown Card Size: 7-7/8 x 5-5/8 inches Packed in Boxes of 18 Cards & 18 white red foil-lined envelopes - Made in China 2010 Introduction In Stock - Ready to Ship! MAY YOU ENJOY A WONDERFUL HOLIDAY SEASON AND A VERY HAPPY NEW YEAR! (Inside Verse) Gold Foil, Embossed accents. 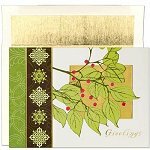 Holiday Collection by Masterpiece Studios Verse Color: Brown Card Size: 7-7/8 x 5-5/8 inches Packed in Boxes of 18 Cards & 18 white Gold foil-lined envelopes - Made in China 2010 Introduction Sorry - Retired & Out of Stock! Best Wishes For The Holidays And The Coming New Year! (Inside Verse) These elegant cards from the Masterpiece Studios are created with a special process of foil embossing. Century Greetings by Masterpiece Studios Special Process Gold & Copper Foil Embossed Verse Color: Gold Metallic Card Size: 7-7/8 x 5-5/8 inches Packed in Boxes of 16 Cards & 16 White Gold-lined envelopes - Made in USA Packaging: Box with acetate lid and gold loop In Stock! May Your Holidays Be Merry And The New Year Bring You Every Happiness! (Inside Verse) These delightful cards are created with a special process of foil embossing. Century Greetings by Masterpiece Studios Special Process Foil Embossed Verse Color: Red Card Size: 8 x 5-3/4 inches Packed in Boxes of 16 Cards & 16 Ivory gold-lined envelopes - Made in USA Packaging: Box with acetate lid and gold loop Sorry - Retired and Out of Stock!